Treating plantar fasciitis can be easy and if you have caught it early and followed your podiatrist’s instructions. Resting, stretching, icing and massaging along with a review of the way you walk and wearing appropriate shoes for plantar fasciitis can help stop this painful disease in its tracks. I would not have managed to beat my plantar fasciitis and run several half-marathons this year without using a foot roller. These are simple devices that are an essential part of my daily routine before and after running. However, there are quite a few different types and models on the market. Which type will be best for you and your painful feet? Let’s take a look at which one will be the best foot roller for plantar fasciitis. Our picks of the top foot rollers for plantar fasciitis. **These links will take you straight to Amazon, where you can review the latest prices and read product reviews. If you want to know my view on why these are the best rollers, read on! Best foot rollers for plantar fasciitis. Now that you know why they are useful, how to use one and when not to, let us look at the top 5 products you can buy today. This rubber roller comes in 2 different sizes (the other model is for a deep tissue massage of both feet at the same time), but I recommend using the larger model as it feels more comfortable to use. The Gaiam Restore roller is ideal if you want to add heat or cold to your foot massage. You can put the roller into the freezer or submerge it in warm water to help give that extra benefit. The gel filling heats up or cools to help maintain the temperature. The texture of the roller is also not too severe, which means it will be kinder on your feet and heels. Some other rollers have larger bumps and ridges which can be painful to use. Great for adding heat and cold to your massage for up to 30 minutes. Made from a quality rubber material. Designed to fit the arch of your foot. Can take up to 20 minutes to heat up. 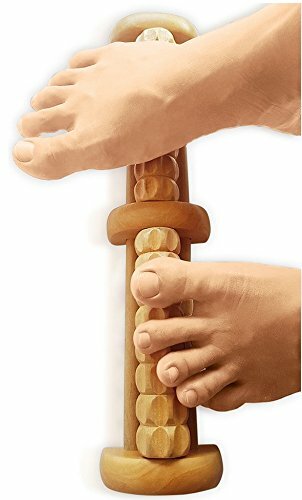 This wooden double-foot massager is great if you want a smaller, more portable roller. Many people also find that wood is better than rubber, foam or plastic. TheraFlow has designed this roller so that you can massage both of your feet at the same time. The square shapes allow you to find the perfect spot on your foot, without overdoing the exercise and causing more pain. It claims to use acupressure, trigger-point relief and reflexology, but these are just marketing buzzwords. However, it does not take away the great results people have had from using a natural product. Made from natural materials for a warmer and more comfortable feel. Works well if you have high arches. Angled roller parts work well at reaching harder to massage areas. Works well with people who have wider feet. Some people report that it can slip on the floor too often, although this might be due to the type of flooring. The Ryson is the foot roller that I own, along with a harder plastic one I picked up from TK Maxx that I keep in the freezer all the time. The Ryson Foot Roller (which seems to be a standard design available from different companies – mass manufactured I suspect) is a no-frills massager that is compact and useful to keep near to your favourite chair at home. The rubber wheels work great on any surface, and the bumps on the rubber grip allow you to massage your feet and heels easily. I found that I was able to roll it around under my foot easily, getting to the edges of my foot too. There is not much to say about this roller other than that it works well. I use this as my general foot massage device and have it nearby so that I can use it when watching TV or reading. I use my frozen roller only after I have been running or walking for long distances. Comes in a small draw-string bag for storage and makes it portable. Also comes with two spiky massage balls. Smaller textured bumps make for a less intensive massage. The colours are a bit bright! It is a bit on the heavy side if you are carrying it around with you. 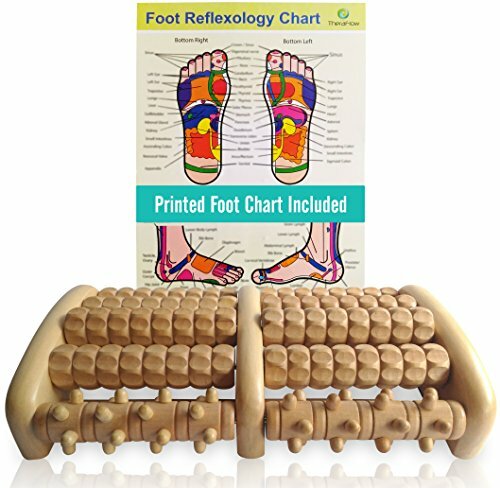 This lovely HealPT wooden foot massager not only looks and feels great, but it is a perfect product to help roll the pains away from your feet. A wooden roller is no different from the plastic, foam or rubber ones I have already mentioned above. They do the same job but can look and can feel more delightful to use. HealPT who make this roller say that it is good for runners, sufferers of plantar fasciitis or anyone with sore feet. 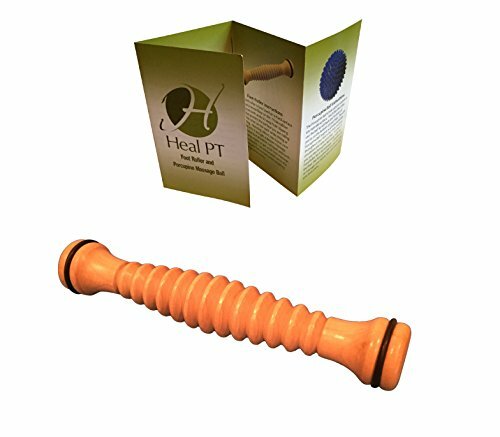 Many people who have bought this have praised how effective it is, and HealPT says that physiotherapists highly rate it for its effectiveness in treating plantar fasciitis. Made from sturdy wood, which can give a harder massage. Very lightweight and portable. It won’t look out of place in your bag. HealPT has included an instruction booklet to help you get the most from your roller. The rubber rings around each end that allow it to roll back and forth can come off quite easily or sometimes snap. May not work very well on carpet due to the rubber rings. So, I have looked at the simple rubber and wooden rollers – let’s get medieval! The TheraFlow is more of a foot massager than a roller, but I wanted to review this product to show what these products are and how they compare. The TheraFlow massager has five rollers per foot, with the last roller nearest your heel featuring more hard bumps. This additional deep tissue pressure will help people with plantar fasciitis or heel pain as they help pinpoint that specific area with extra massaging. The other wooden rollers are patterned with a rough texture to massage the softer areas of your sole. Made from durable wood materials. Designed to be big enough for people with larger feet. The TheraFlow has a different level of massage roller near the heel. Has a lifetime guarantee to cover defects or damages. May not be easy to carry with you. Wooden rollers may squeak after using it for a while. We reveal our choice of the best foot roller for plantar fasciitis. So as you have read, there are many different options out there to help with your plantar fasciitis. However, based on the fact that you can use it with or without heat and cold, the Gaiam Restore Foot Massage Roller gets my vote. 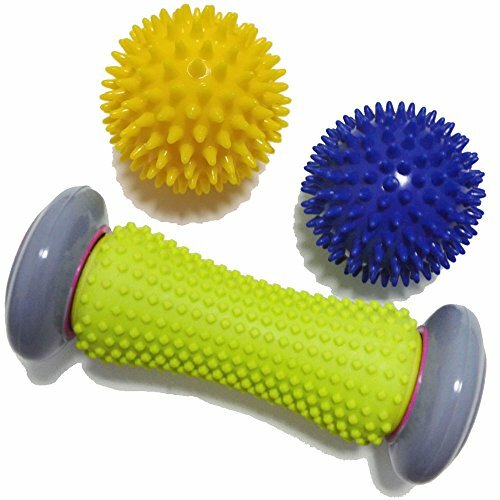 The Ryson Foot Roller And Massage Ball pack comes a close second, but the bright colours might put people off using it. I do love using it at home, but using the Gaiam Restore once it has been in the freezer makes more sense. The Gaiam is not designed with a rough massage in mind and does not claim to be an acupuncture/acupressure/trigger point (insert buzzword here) roller. It can be used anywhere as it is light and small enough to take with you and is also not too expensive either; you don’t need to spend lots to get a good foot roller. Having plantar fasciitis is very painful and regularly massaging the affected area on your foot with a roller like the Gaiam Restore will help reduce pain. It does this by releasing tension in the ligaments and muscles in your foot and around your heel. Why are foot rollers good for treating plantar fasciitis? Your doctor or podiatrist will suggest using a foot roller as part of caring for your injured plantar fascia ligament. You can massage the affected area with your hands, but using a foot roller will help treat the sole of your foot.Let’s look at the main benefits of using a foot roller to treat foot and heel pain. Rollers and massagers are easy to use, small enough to store away at home or take with you to the office. You don’t need a PhD in foot mechanics to know how to use one. Foot rollers come in different hardness settings. Some of us will like a more gentle massage on our painful heel area, but others will enjoy using the studs or textured rollers to help pinpoint a specific area. As well as different hardness options, foot rollers are available in different materials. From a simple foam tube to a wooden rack that you can massage both of your feet on at the same time. Apart from helping release plantar fasciitis pain, foot rollers can help improve blood flow to your feet. If you don’t suffer from plantar fasciitis, they can also be used to relieve tensions and stresses if you have had a hard day on your feet. There are products you can buy that can be heated in water for an added soothing feeling, or frozen first, to help reduce inflammation. I always use a cold foot roller to help treat my plantar fasciitis – it does make a difference. How to use a foot roller. Let me start by saying that there is no right or wrong way to use a foot roller. You should not stand on one with your full body weight as it will either break in half or cause you more foot pain. How much will depend on the level of pain you have, how tender your sole and heel are and how much time you have. Ideally, you should not use one for more than a few minutes at a time as overuse can cause your fascia ligament and foot muscles to become inflamed more. Remove your shoes, sit in a chair and place the roller on the floor in front of you. Place your foot on the roller and start to roll it around, noting where it is most painful. If you have a smaller roller or massage ball, try to cover the entire surface of your foot so you can feel where you need to concentrate the pressure. Start to massage the painful area gently, by rolling back and forth. Angle your foot slightly by tilting your ankle from side to side. Doing this will help reach the contoured areas, arches and edges of your foot. Only massage gently for 20 seconds and move to the other foot. Repeat the process up to 5 times, but stop if the massage becomes painful. If you are suffering from plantar fasciitis, I would recommend using a roller several times a day. You can use it when you are watching TV or reading without too much additional effort. If you work in an office, take the roller with you and pop it out for a quick session when you have a few spare minutes. People won’t even notice what you are doing. If you are a runner, do your cool down stretches and then use the roller immediately after running and if possible use a product that you can freeze. The cold roller will help reduce pain and inflammation of the muscles and ligaments in your feet. The worst thing you could do is run and then sit. How to choose your foot roller. There is no right or wrong way to choose a foot roller – it all depends on what type you prefer. Your main consideration is if you want it to be portable or not. Some of the larger wooden rollers are not designed to take with you. Compared to a small foam roller, they are quite bulky but do give a good massage. Your other consideration is if you want to use heat or cold as part of your treatment. Some are safe to store in the freezer (usually made from hard plastic) and others you can heat up in hot water. Having heat or cold is not a deal breaker though. You still want to choose a roller that is practical, fits your needs and budget. Do foot rollers help plantar fasciitis? Results of a 2008 query of orthopaedic surgeons who are foot-and-ankle specialists showed that for patients with more than four months of pain, 74 out of 116 surgeons preferred plantar fascia-specific stretching and supervised physical therapy over anti-inflammatories or corticosteroid injections. In 2008 over 100 orthopaedic surgeons who are foot-and-ankle specialists were asked about their treatments and the study found that over 85% recommended stretching exercises instead of invasive injections or surgery. Amongst the stretches recommended, was using a foot roller both before going to sleep and first thing in the morning before taking any steps (when plantar fasciitis pain can be at it’s worst). They recommended rolling three times for 60 seconds, with a 30-second break in between each time. Regular use, combined with their other plans of calf muscle stretches and hand massage were effective in reducing plantar fasciitis pain. It is not a cure but will give temporary relief from a debilitating and painful disease. So in summary, yes – foot rollers do help relieve plantar fasciitis pain. Should you even be using a foot roller? Ideally, you should use a foot roller in conjunction with advice from a podiatrist. However, some gentle massage will not be detrimental to you if you proceed without their help. Do not use a roller if you have any cuts, scabs, severe bruising or damage to your skin. You may make your situation worse. If you have diabetes or have neuropathy (nerve pain) related to an existing medical condition, seek medical advice before you use a roller or massager. If you have any infection such as a toe or nail fungus, please do not use a foot roller. You risk spreading the disease to other parts of your feet, your hands and even to other people if you share. If you have fallen arches or flat feet, you should avoid using a roller altogether. Because your muscles and ligaments are more prone to damage, even a small bruise or discomfort from massage might make each step painful.